Millions of Americans have slipped and slid into poverty in recent years because of their own financial ignorance, the erosion of mutual helpfulness in society and predatory megachurches that espouse prosperity theology at parishioners’ expense. But getting the estimated 46 million poor Americans out of poverty will require wholesale changes in how we talk about, think about and take action around poverty. So said author, religious studies scholar and media commentator Anthea Butler, keynote speaker for the college’s 2013 Martin Luther King Jr. Day observance on Jan. 21. 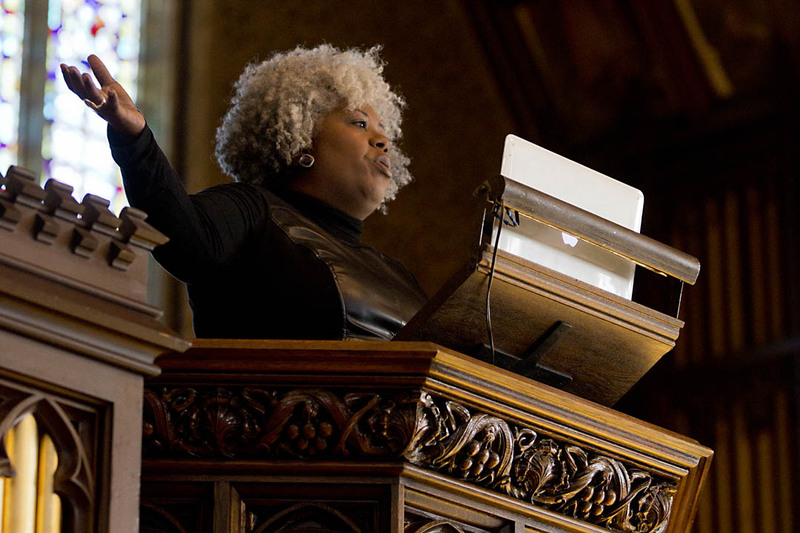 Anthea Butler, associate professor and graduate chair of religious studies at the University of Pennsylvania, delivers her keynote address, “MLK and America’s Bad Check: America’s Poor in the 21st Century” in the Gomes Chapel. Photograph by Phyllis Graber Jensen/Bates College. 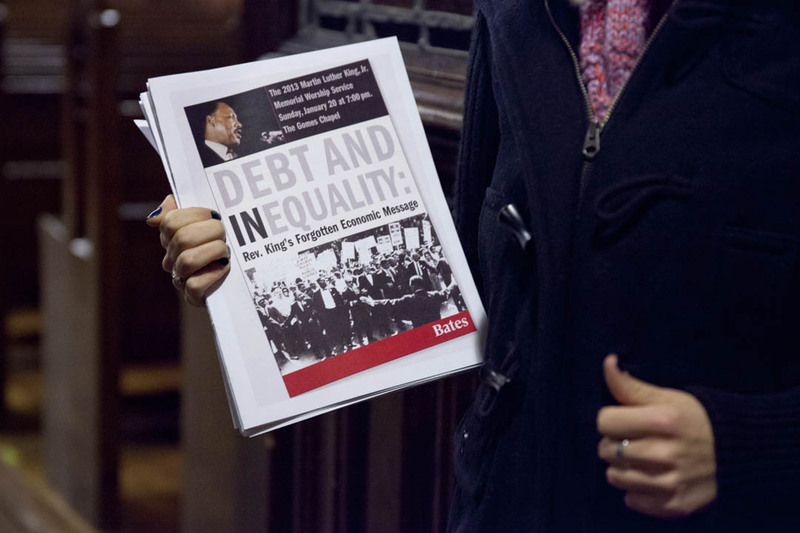 Delivered from the Gomes Chapel pulpit, Butler’s address, “MLK and America’s Bad Check: America’s Poor in the 21st Century,” was a pointed reflection on the overall theme for the college’s observance, Debt and Inequality: The Relevance of King’s Forgotten Economic Message. Her prescriptive message on Monday morning represented something of an answer to the homily she offered the night before at the MLK Memorial Service. Dr. Butler argued convincingly that we as a nation are in captivity. We are in captivity to guns, to debt, to fear, to poverty. How do we make our way out of this captivity, Dr. Butler asked. This is the question, she says, we must ask ourselves. The day’s theme reflects Martin Luther King Jr. focus on poverty beginning in 1967, a “forgotten economic message” today. Photograph by Phyllis Graber Jensen/Bates College. In her keynote, Butler began her to question her question by looking back at the Poor People’s Campaign, a six-week program of nonviolent action in Washington, D.C., in the late spring of 1968. 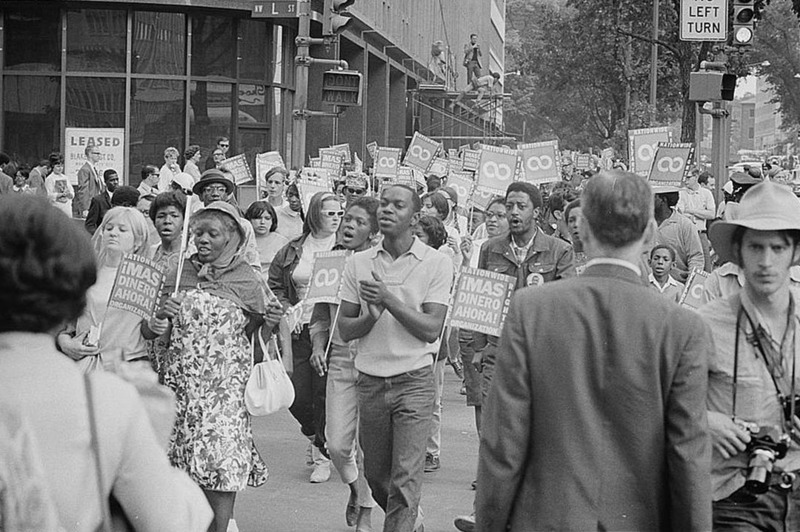 The Poor People’s Campaign, King’s brainchild and undertaken after his April 1968 assassination, marked a turning point of the civil rights movement. Despite the Great Society programs and gains of the civil rights movement, “Negros are still impoverished aliens in an affluent society,” King said. The Poor People’s Campaign featured an encampment on the Washington Mall. It became a place where activists collaborated around a loose set of goals; where protesters lived in tents and lean-tos; and where a system of food distribution kept everyone fed. Protesters march at Lafayette Park and Connecticut Avenue in Washington, D.C., on June 18, 1968, during the Poor People’s Campaign. Photo: Warren Leffler, U.S. News & World Report Magazine Photograph Collection, Library of Congress. It was a moment in America where we focused our attention on people who were willing to camp out and say the economic system was wrong. How do we get that again? How do we start to talk about inequities without movements like Occupy? How do you do that? I call this the nation’s new Ayn Rand philosophy: We’re all on our own; we can choose to be selfish; we don’t have to help anyone; and those we see who are impoverished are there because they want to be. 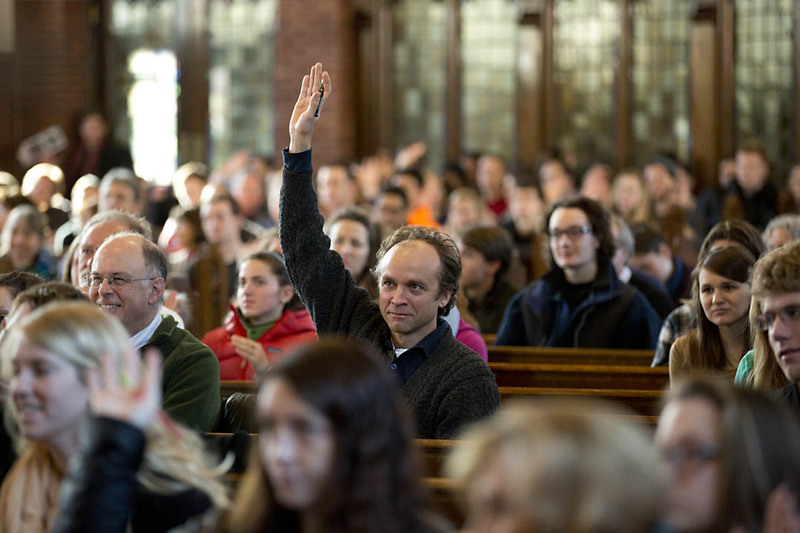 Robert Strong, graduate fellowship adviser and faculty member in English, and others respond to keynote speaker Anthea Butler’s call for a show of hands of student-loan holders. Photograph by Phyllis Graber Jensen/Bates College. But that’s hardly true, Butler says. Whereas the African American church traditionally included sound financial advice as part of its ministry, the rise of the prosperity gospel has destroyed that tradition — to the great detriment of church parishioners. The moral center has changed in the community; the moral center has been to give to your church and help each other, now the church has become a capitalist place to make more money. This is wrong. Solving the poverty problem needs to move beyond the more government / less government argument, Butler said. It even needs to move beyond discussion and posturing. “I’m tired of the bus tours,” she said, perhaps a reference to the high-profile “Poverty Tour” by Tavis Smiley and Cornel West in 2011. “I don’t know what it gets you if you ride a bus, but you haven’t done anything about feeding someone at the local homeless shelter,” she said. 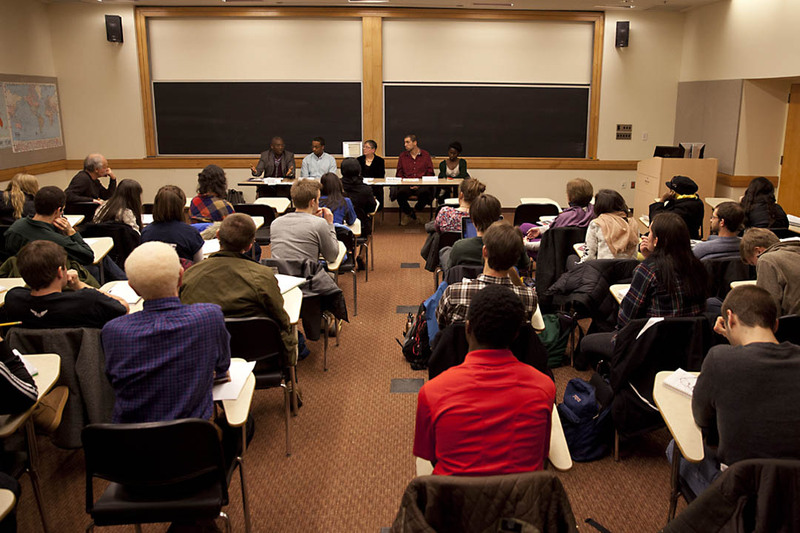 After the morning keynote, a variety of afternoon panel discussions featured community leaders, students and faculty. Featuring recent Bates sociology research, this panel discussed ways to build financial literary among Lewiston-Auburn’s immigrant community. Photograph by Phyllis Graber Jensen/Bates College. Instead of observing, we must “realize that we have poor people who will be intrinsically harmed, and their children will be intrinsically harmed” if we do not take action to help. After all that jazz, Associate Dean of Students James Reese, considered a founder of the King Day observance at Bates offered a few remarks that drew gasps and applause from the gathering: see story. 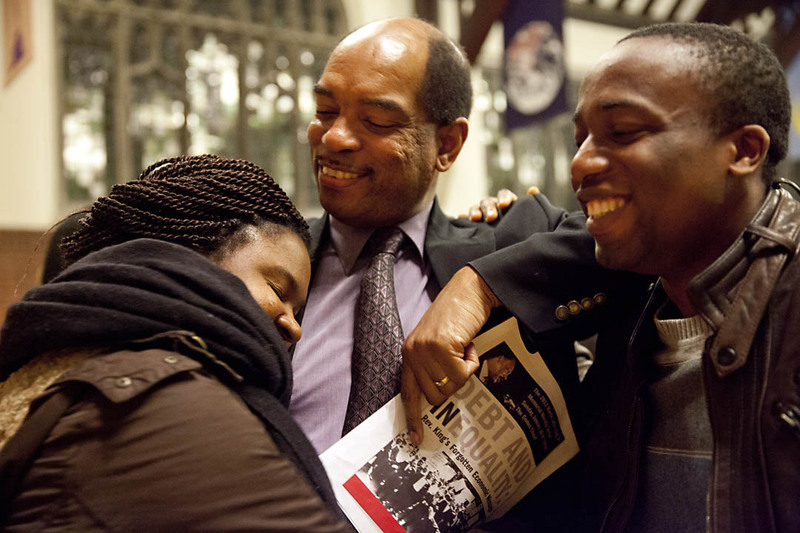 Associate Dean of Students James Reese greets Linda Kugblenu ’13 and Victor Babatunde ’11 after the annual Martin Luther King Jr. Memorial Service on Jan. 20 in the Gomes Chapel. Photograph by Phyllis Graber Jensen/Bates College. We make the choice a matter of shared values when we encounter each and every member of this community as an individual deserving of dignity, respect and the opportunity for self-realization. 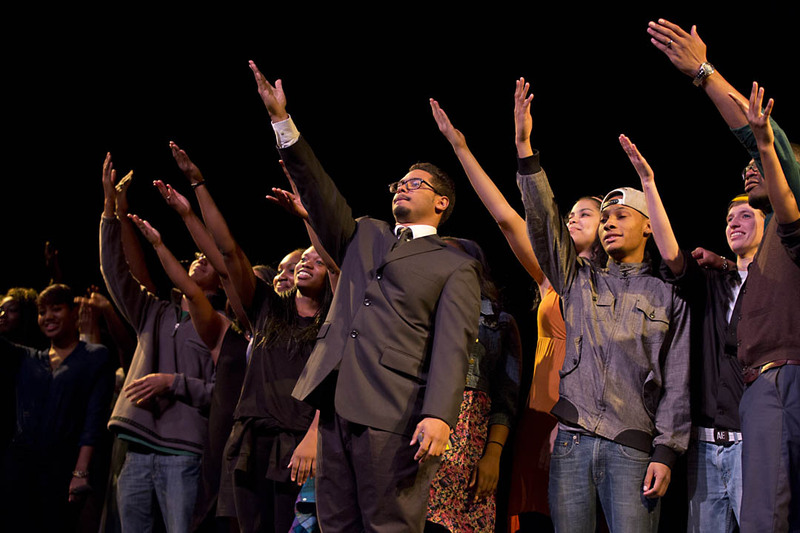 Performers in the annual Sankofa production, including director Alex Bolden ’13 (center, in suit), acknowledge the audience’s applause after their evening performance on Martin Luther King Jr. Day. Photograph by Phyllis Graber Jensen/Bates College.